61 loyalty points Your cart will total 61 points that can be converted into a voucher of 2,44 PLN. 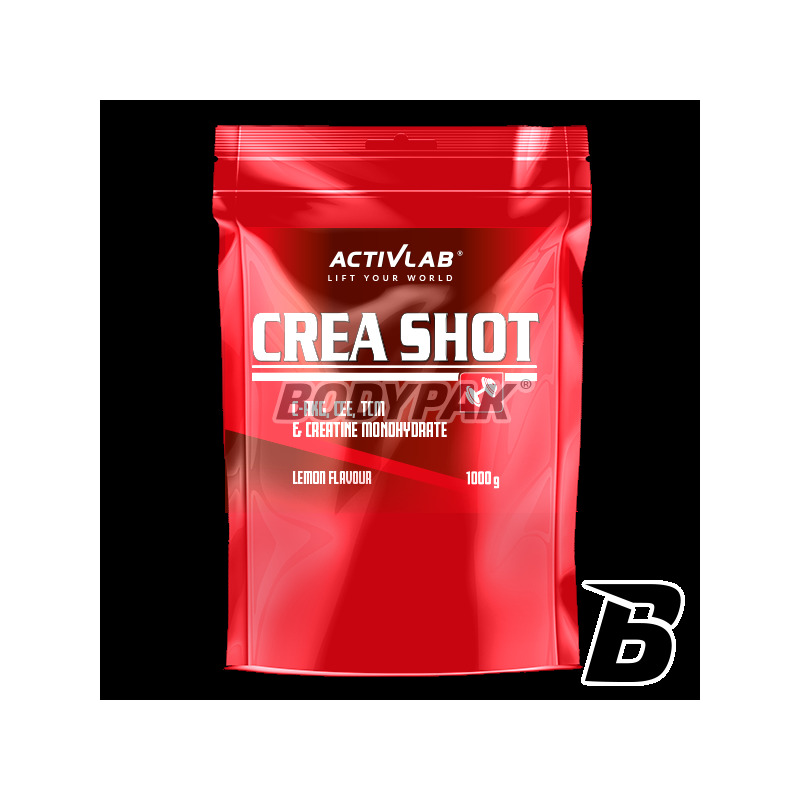 Activlab Crea Shot is a classic product of proven effect. If you are looking przedtreningówki, which has been tested by thousands of bodybuilders and still gaining followers - reach for the supplement. Perfect solubility and nuanced flavor (each) are additional benefits Crea Shot. You will not be disappointed! 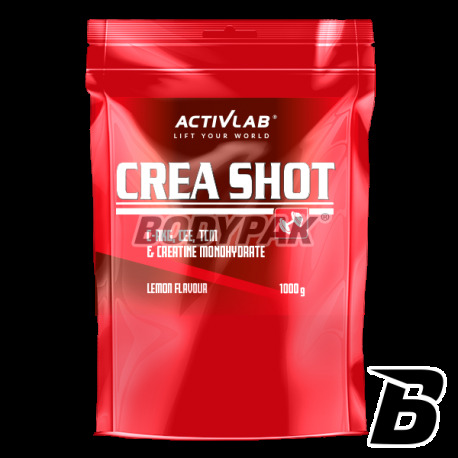 Activlab Crea Shot - a mixture of 4 forms of creatine with different absorption kinetics - buffered creatine monohydrate, creatine ethyl ester (CEE), alpha-ketoglutarate (CAKG), creatine malate and matrix pomperów and transporters. - 4 forms of creatine with different absorption speeds - buffered creatine monohydrate, creatine ethyl ester (CEE), alpha-ketoglutarate (CAKG), creatine malate. - Four components which enhance the production of nitric oxide and blood pressure - citrulline, caffeine, arginine and the two forms - including arginine alpha-ketoglutarate (AAKG). - Transport, nutrition, regeneration - 4 working synergistically enhancing ingredients: taurine, N-acetyl-L-glutamine, L-glutamine and carbohydrates with differentiated IG. Use one serving in the morning on an empty stomach and an additional one serving 30 minutes before workout. Składniki: maltodekstryna, monohydrat kreatyny, arginina, alfa ketoglutaran argininy, regulatory kwasowości (kwas cytrynowy, cytrynian sodu), substancja przeciwzbrylająca dwutlenek krzemu, jabłczan kreatyny, ester etylowy kreatyny, alfa ketoglutaran kreatyny, N-acetylo-L-glutamina, l-glutamina, tauryna, jabłczan cytruliny, aromat, substancje słodzące aspartam i acesulfam K, kofeina. The lemon taste is a bit sour, but you get used to it fast, and you can't get enough, the price is great for 1kg, only con is, that a serving of 25g doesn't contain as much creating as I'd liked, but you can of course put some more in of a neutral taste. Polecam ten produkt zrobił na mnie duże wrażenie znaczny przyrost siły dobra pompa podczas treningu. Już 3 worek za mną za pierwszym razem najlepszy efekt. Niska cena jakość swietna polecam! Świetny stack kreatynowy w połączeniu z matrixem pomperów - tego właśnie szukałem! W smaku bez szału, ale to ma działać a nie smakować - polecam! Trec Kre-Alkalyn - 90 kaps. Creatine Monohydrate - the highest quality Micronized, free from any contamination, Creatine Monohydrate. It is most effective with legal anabolics. 200 Mesh Creatine Taurine - thanks to proper can be within a few weeks to achieve 10-20 percent strength increase and gain 3 to 5kg of lean muscle mass.